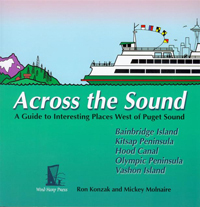 Ron Konzak, a Bainbridge Island original, is the co-author of Across the Sound: A Guide to Interesting Places West of Puget Sound (2004). Written together with his wife Mickey Molnaire, the book introduces readers to well-known local destinations as well as places overlooked by the official visitor brochures. Konzak also wrote a self-help book Lifegraph (1985) and The Book of Ramen (1993), a cookbook for Ramen noodles. His eclectic book topics reflect the many interests he held during his lifetime. In addition to operating a B&B on the island, Konzak was an architect, a woodworker, a harpmaker, and member of a 1970s rock band. He travelled throughout Europe with a dance group, journeyed through Japan with Buddhist monks, and lived in a rural Korean village. When Konzak passed away in 2008, Sally Robison wrote of him in the Bainbridge Island Review: "His accomplishments, his ideas, and his harps… well, just about anything you might mention as a career, he has done. (Except medicine and law because I don’t think he was interested in those fields.) You might say that originality was his goal in life – besides loving his wife and son. Who else would write a book about noodles? Build a harp that the wind could play? Build an authentic Japanese bed and breakfast, a Buddhist temple? I could continue a longer list, but columns must be compact..." For more information on this author and, among other things, a history of Ramen noodles, please visit http://www.konzak.com/.